How breaking one of the golden rules of innovation helped Disney Animation get back on top. About a decade ago, Disney Animation nearly came to a premature end. After a series of poorly performing films the corporation was considering closing down its famous studio, instead they bought the newer kid on the block, who was on perhaps the hottest streak ever in animation – Pixar. Now 10 years later Disney is celebrating the success of Frozen its highest- grossing animated film ever and has already started work on Frozen 2. The practice of a rapid sequel, like Toy Story 2, however isn’t the key idea that Disney has taken from Pixar. The practice that is being credited with helping turn around the situation is “the story trust”, which itself is said to be based on the notion of “we is smarter than I” and the use of “Crit” sessions. It is a process of collective but constructive criticism. During the development of a new film, it is screened up to seven times to an audience of Disney Animation employees who are free to give their opinions both good and bad. The director and a ‘trust’ of 20 executives then meet off-site to consider and address the criticisms. The sessions generally last a day but can be longer is the criticisms are numerous or fundamental to the storyline or characterisation. 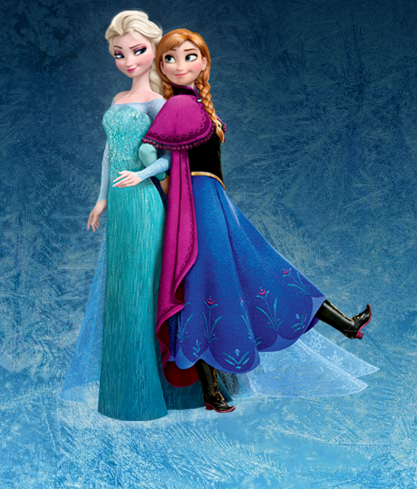 Frozen went on this journey and made “seismic changes” along the way. At the start, Else and Anna weren’t sisters, Elsa was the villain of the piece, there were no trolls nor was there any Kristoff. The use of “crit” sessions was originally adopted at Pixar as a means for the team of early pioneers of computer animation to learn from each other successes and, just as importantly, each other’s mistakes. 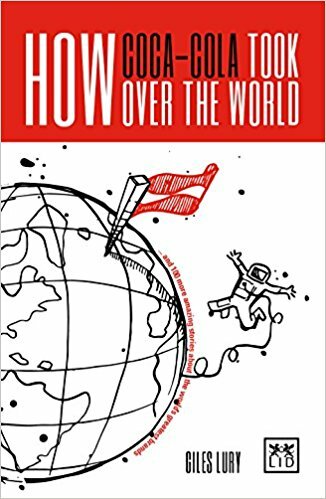 Ed Catmull one of that early team and now President of Pixar Animation Studios credits Toyota with helping to inspire the approach that encourages the whole team to catch mistakes before it is too late. That same philosophy, which helped Pixar, is now very influential at Disney Animation. Not all ideas are good ideas and sometimes those in charge need to be told. It may therefor break one of the golden rules of innovation but it is helping Disney deliver quality product – great and highly successful animated films. The day after Christmas 1944, Kevin Bell left this family’s Oaktown farm for the World War II battlefields of the Pacific. In his duffel bag, along with his clothes and some personal things, he took six bottles of Coke. 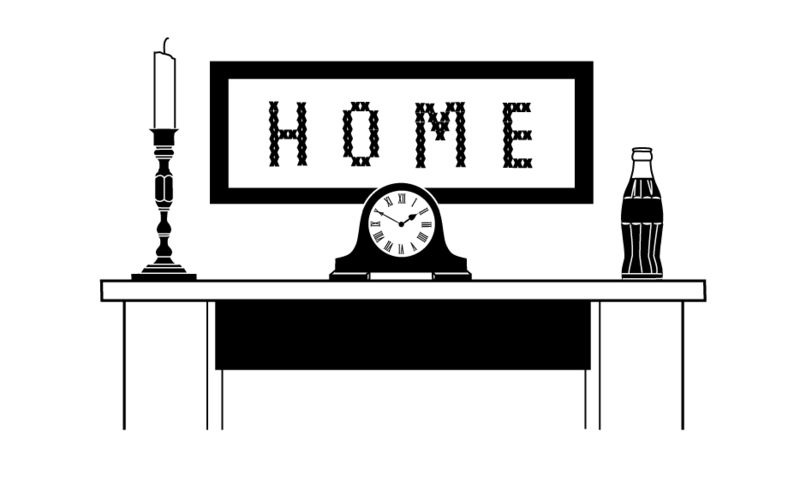 The first time he got homesick, he drank one as it reminded him of life back on the farm. He shared four more with fellow soldiers whilst in Burma. Well, he never opened it. He carried it back to the farm, where it sat for more than 30 years on the mantelpiece in the living room. When the farmhouse caught fire in 1990, Kevin, by then an old man, rescued it from the burning building – one of the only material possessions he fought to save. NIVEA – how much does a beauty brand need to respond to changes in depictions of beauty? The theory goes that the beauty business is notoriously fickle and adapting to trends can be key to success. The history of Nivea is interesting in so far as its brand’s imagery and advertising shifted in response to just such a change some 90 years ago, but since then it has maintained fairly consistently and any changes they have made have been less fundamental. The Nivea story begins at the beginning of the 20th Century, when chemist Dr. Isaac Lifschütz invents Eucerit, a stable wax that manages to combine water and oil. Dermatologist, Professor Paul Gerson Unna introduces him to the entrepreneur Dr. Troplowitz for whom he is a scientific advisor. He suggests it would make the perfect basis for a cosmetic skin cream. Together, they developed the world’s first stable oil-and-water-based cream that was suitable for mass production and called it NIVEA. In addition to Eucerit, the original formulation contained glycerin and a little citric acid. It was fragranced with rose and lily-of-the-valley oils. It was named for its pure white colour; the word NIVEA being derived from the Latin word “nix, nivis” meaning snow and was launched in 1911. It was packaged in a stylised yellow art nouveau tin in keeping with the then classic imagery of feminine beauty, sometimes referred to as the “femme fragile”. However as the (roaring) 1920s arrived and notions of feminine beauty changed, the brand started to look distinctly out of date. A new depiction of beauty was emerging; younger, more self-confident and active. 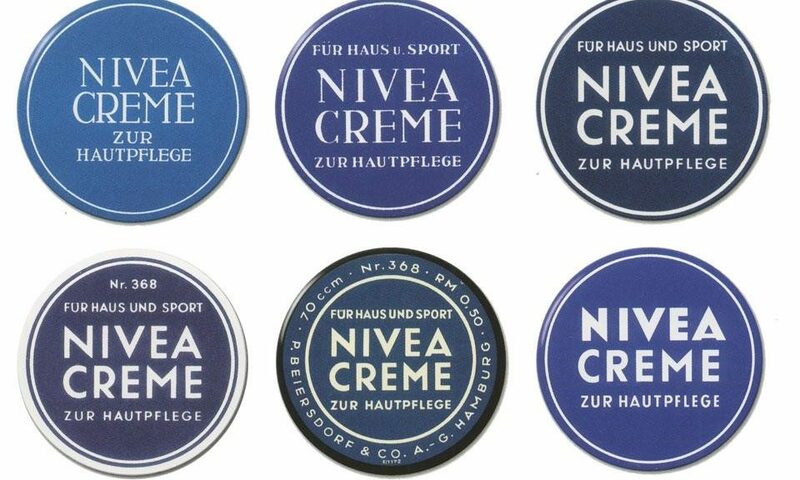 The NIVEA Creme tin was redesigned to reflect the new zeitgeist, a world now more focused on “youth” and “leisure”. The winners, sisters Margot, Elfriede and Hertha Fröhlich of Flensburg, north Germany were to star in a series of NIVEA ads throughout the 1920s. 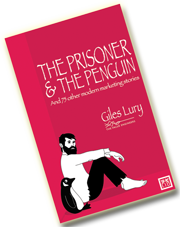 In the 1930s, Elly Heuss-Knapp became marketing manager. She recognized the potential of the blue and white brand colours and made sure they were incorporated in all the campaigns she managed. She also took the brand ‘outside’ associating it with blue skies, sunshine and a more athletic lifestyle. A new slogan was devised “NIVEA in Luft und Sonne” (Nivea in wind and sun) reflecting the new positioning and reinforcing the brand message of its suitability as protection for men, children and women as well as role in enhancing beauty. Since those radical changes in the 1930s, the brand, its advertising, product range, formulations and indeed the design of the iconic tin have evolved continually; it hasn’t gone through another revolution and perhaps it won’t until society shifts again and decides that youth and freshness are the most desirable aspects of beauty. The story of how Peugeot travelled from corset supports in dresses to motor cars is one of the better-known tales about the brand. However, a detour via the kitchen table that led to the development of a design classic and the acquisition of the famous lion logo is another enjoyable trip. Both stories start in Sochaux, France where the family lived and where Jean-Pierre Peugeot had a business manufacturing water mills. In 1810, The “Peugeot Frères” company was established, and along with Jean-Pierre II and Jean Frédéric Peugeot and another partner, Jacques Maillard-Salins, Jean Pequignot purchased a cereal mill at Sous Cratet in the Montbeliard region and set about converting it into a steel factory. Once completed the new steel mill started to produce sheet steel and various hand tools, but the firm soon diversified into other areas. These included saws, saw blades, razors, sewing machines, roasting spits, spectacle frames, watch springs, clocks, garden furniture and the famous wire supports for crinoline dresses. Amongst this ever increasing range, the inventive “Peugeot Frères” were most famous for their high-quality saw blades. They had developed a technique of individually cutting the teeth before casehardening the blade. Their process added a carbon-rich alloy to the steel surface for extra strength and meant the teeth stayed sharper for much longer. Another diversification was into metal wheel spokes and wheels that were the first moves into the transportation business. These would lead to the establishment of the Peugeot bicycle brand, where their first bicycle was hand built in 1882 by Armand Peugeot. It was a penny-farthing called “Le Grand Bi”. Soon after Armand became interested in the new world of the automobile and, following a meeting with Gottlieb Daimler, he became convinced of their potential as a business. The first Peugeot automobile, a three-wheeled, steam-powered car designed by Léon Serpollet, was produced in 1889. However, before then in 1842, Jean Frédéric would use the blades and simple grinding system which they had used for a successful range of coffee bean grinders as the basis with which to create the classic pepper mill. The design which has remained pretty consistent was straightforward. There was a container for the dried peppercorns, which had a chamber at its bottom containing two set rows of grinders. As the peppercorns passed through the chamber, they were first cracked and then finely milled. The two rows of grinders were individually cut and casehardened using the special process used on the saw blades, giving the grinding mechanism an almost infinite life. 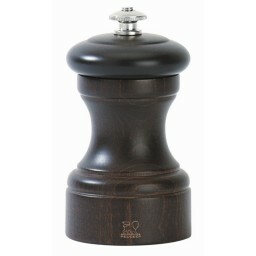 Rotating the base or loosening the top screw of the new Peugeot pepper mill changed the ferocity of the grind from a loose crunchiness to a refined powder. The innovation was perfectly timed as black pepper, which had been previously known as “black gold”, was becoming more readily available and cheaper; the result of the increased frequency of fast ships from south India and the new railway systems in both India and France. In the 1850s, the family chose the symbol of the lion as its trademark to reflect the strength of their company’s products and symbolising the durability, suppleness and quickness of their metal and steel. The lion also stood for the speed and aggressiveness of the Peugeot company.A lion trademark designed by Justin Blazer, a Montbeliard gold engraver was registered in1858. It was the perfect symbol for the pepper mills as it intimated that their grinding system was every bit as strong as the mighty animal’s jaws and, of course, it would prove to be a suitable icon for their future cars too. A family obsession – Spreading a little luxury? Everyone in Piedmonts had hazelnuts, lots of hazelnuts. The region has long been famed for its production of the delicious nuts and, even, just after the war, they were available in abundance. Reflecting that human truth that you don’t always value what you have and instead covet something that you can’t have, what many of local population really craved, wasn’t hazelnuts it was chocolate. Chocolate was still very scarce, having been severely rationed during the war and it was so expensive it wasn’t something ordinary Italians could afford. Local baker Pietro Ferrero decided there had to be a solution. It was to become his obsession. He wanted to create an affordable chocolate-y luxury that everyone could enjoy. He started work on adapting a recipe for “Gianduja” a sweet chocolate confection invented in Turin, during Napoleon’s Regency by chocolatier Michele Prochet. Prochet had been faced with a similar lack of chocolate supply, only his problem was caused by the British Navy’s blockade and not World War Two. His solution was to extend the little chocolate he had by mixing it with hazelnuts from the Langhe hills south of Turin. Pietro’s idea was to create something similar but he wanted to find the perfect recipe. In 1946, finally happy with his recipe Pieto launched Giandujot, or Pasta Gianduja; “pasta” means paste, and “gianduja” is also the name of a carnival character famous to the region, a character that Pieto would use in the first advertisements for the product. Pieto’s Pasta Gianduja was made in loaves and wrapped in tinfoil. As it was a soft but solidified block of chocolate and hazelnuts, it had be cut with a knife and the resulting slices would then often be placed on bread. Pieto wasn’t completely happy and carried on working away on the recipe and in 1951 he launched “Supercrema”, a spreadable version. Spreadability was a big step forward. It meant that a small amount went a long way, further helping to break down the perception that chocolate was only for special occasions and celebrations. Pietro’s son, Michele, inherited his father’s drive to democratize an affordable everyday chocolate treat. Giovanni says his father was a man obsessed, just like his grandfather. The new formulation, whenever it was actually launched, and the new name gave the product instant international appeal. The name said nuts. It also said Italy as “-ella” was an ending linked with Italian foods like mozzarella (cheese) and tagliatella. 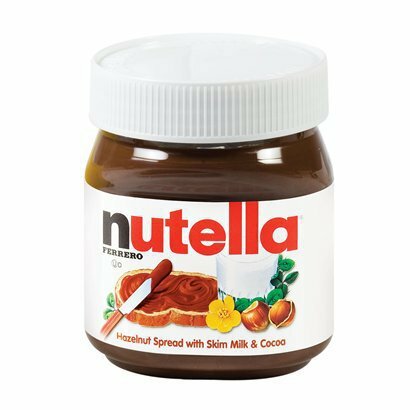 Nutella is still a major global brand, produced in 11 factories worldwide and the company, founded by Pietro Ferrero, is the number one user of hazelnuts in the world. They buy about 25% of the entire world production and clearly, they see the value of those nuts.